Tucked in a back corner of Mt. 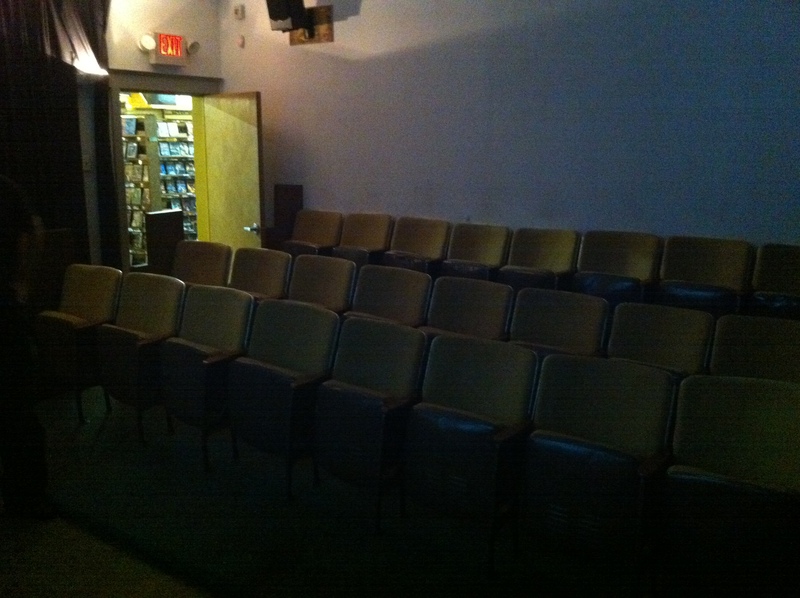 Airy’s Video Library, one of the Philadelphia area’s few remaining independent video stores, sits The Little Theater, a 25 seat digital screening room built a couple years back by David Titus who later moved to Lansdowne and founded Cinema 16:9. 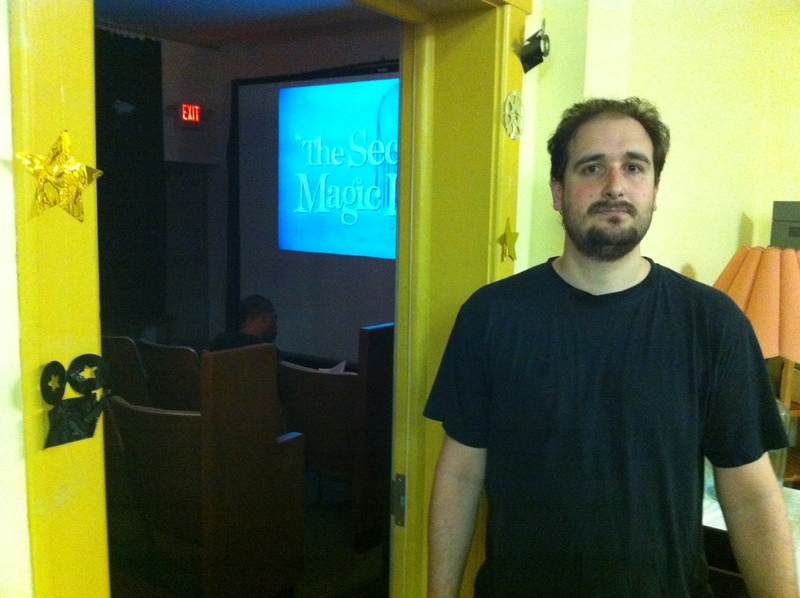 This past February, after sitting dormant for nearly a year, the reigns of The Little Theater were taken over by local film critic/highly opinionated film nerd extraordinaire Adam Lippe who now hosts screenings of little-seen films every Thursday at 7:00 PM under the Medium Rare Cinema moniker. I attended last week’s MRC screening, a fan edit of John Woo’s Bullet in the Head (more on that later), which was, in a word, a disaster. For the sake of Cinedelphia’s journalist integrity (haha) I will indeed relate my experience in full, but first a few quick words from Mr. Adam Lippe. Cinedelphia: What is the basic premise behind Medium Rare Cinema? Adam Lippe: To show films that, for whatever reason, have never received a legitimate DVD release in the United States. This includes recent films like I Come With the Rain (which remains unreleased in this country because of the dwindling theatrical market for indie films) or older stuff like $10,000 Blood Money. The main criteria is that the film has entertained me in some fashion. If I think the movie is boring, I’m not going to show it. It might give me some bogus street cred for showing obscure and alienating films, but that doesn’t help anyone. The concept was originally designed to encourage discussion about film (because I find most film discussion in this city to be dictatorial), the movies themselves were just conduits. There were several things I wanted to accomplish; to give patrons their money’s worth which is why we have a thematically relevant short film (unless the main feature runs over 2 hours) and a trivia game in which I give away screeners, and to show the kinds of films that the public would enjoy, if they were aware of it. C: Do you feel like you’ve carved out your own niche in the community of Philadelphia film programming? AL: Since I’m the film critic for the local papers around here (Mt. 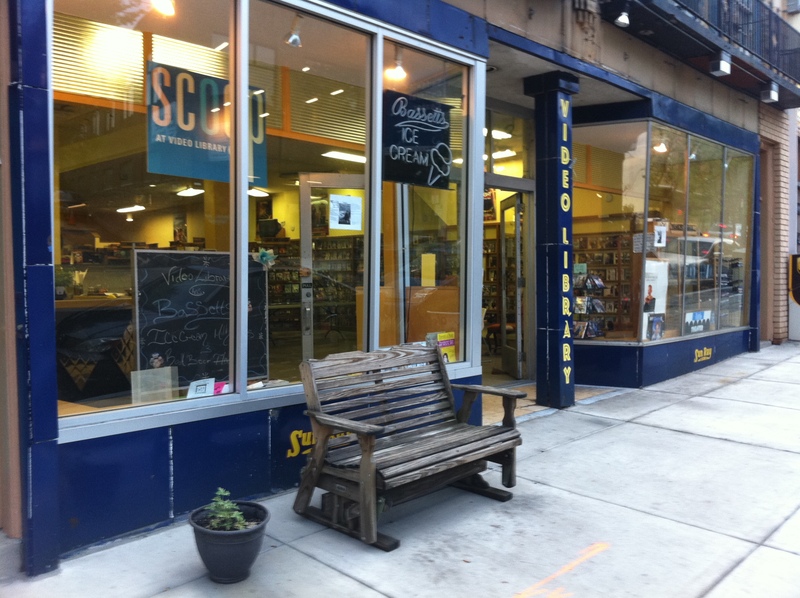 Airy Independent and Germantown Chronicle), I already have a modicum of cache in terms of film. Since The Little Theater used to show only mainstream films and stopped for about a year, it’s simply going to take time to remind people that they can expect to be entertained and sometimes even bring their kids (Barbarosa is rated PG and being shown on May 26th). I do think it’s important for people to have experiences they couldn’t have anywhere else, so for all of the films, the best source elements are acquired, or proper matting is done for open-matte discs (such as with The Challenge) or as in the case of Ringo Lam’s School on Fire where the translation was so awkward and literal that I re-wrote each and every line for clarity. It ends up being a much better movie and hopefully it can eventually be brought out of obscurity. Noble words from a nice guy. Now as mentioned above, the cut of Bullet in the Head that was screened last Thursday was an edit that Adam created himself. By adding the “piss scene” and eliminating the closing car chase segment, he was able to create a version of the film that was, based on his readings, “closest to how John Woo would have wanted it.” Obsessive behavior for sure, but it’s to be expected from a guy who sometimes rewatches films in black and white just to see if they’re any better sans color. 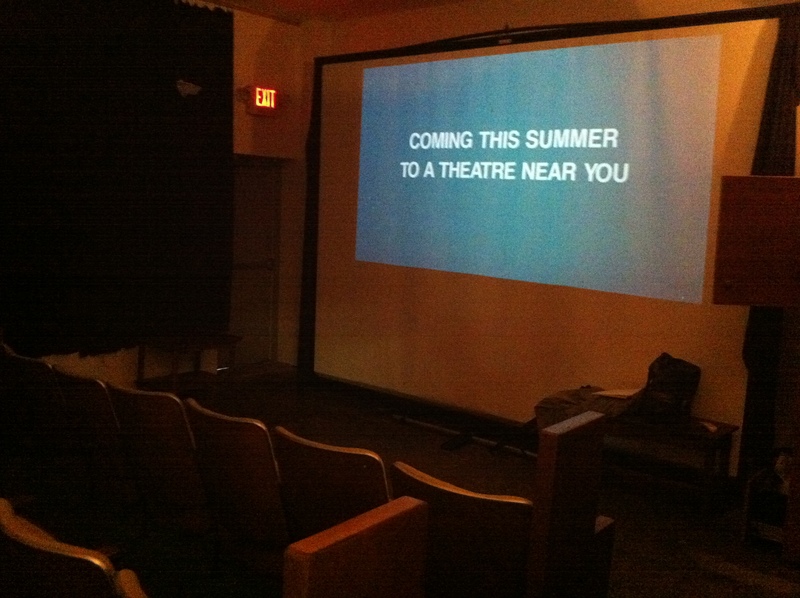 I joined the theater’s only other attendee, a regular, shortly before 7:00 PM. The next hour was spent chatting, eating free popcorn, reading an Adam-penned essay on the film of the evening, and watching pre-show entertainment that included a Full Moon Features trailer reel and a pilot for an 80’s breakdancing show called Graffiti Rock that featured a young Vincent Gallo (known then as Prince Vince). By 8:00 two other regulars had joined us and Adam’s girlfriend had arrived with the burned disc of the evening’s film in hand. Turned out it wasn’t compatible with the room’s DVD player so Adam ran home to get his own. The evening’s trivia contest was held via satellite as Adam’s girlfriend recited the questions that were delivered to her via cell phone and then recited the answers back to her absent boyfriend. “Name two of John Woo’s American films.” “What was the English title of Drunken Master 2?” (I said Drunken Master, but the answer was Legend of the Drunken Master). The prizes were used DVDs that Adam presumably no longer had a use for (I chose a copy of Hector Barbenco’s Ironweed starring Jack Nicholson). The replacement DVD player was up and running by quarter after and, after a brief introduction, the film ran smoothly for about an hour until the disc was unable to change layers and the film stopped completely. Adam attempted to hook up his laptop as a replacement for the replacement, but to no avail. By 9:40 the others in attendance agreed to huddle around Adam’s laptop screen to watch the remainder of the film, but I checked out as I had a midnight screening of Pirates… to attend (a terrible film that I’m not reviewing simply to avoid thinking about it again) and I’d originally expected to leave the theater around then anyway. And thus the evening couldn’t have gone worse for poor Adam who has surely spent the past week nervously awaiting this post. Adam’s girlfriend assured me that technical difficulties of this magnitude had only occurred once before (and she seemed the trustworthy sort) so my personal experience should only be considered a blip on the MRC radar. Cinedelphia recommends you check it out for yourself as it’s a unique movie-going experience in any case. Adam e-mailed to remind me that he also rewrote all of the subtitles for Bullet in the Head for the sake of clarity/proper grammar. I should also mention that he gave me a corrected copy of his version of Bullet… at a screening in Center City the morning after the above event proving that he is indeed a stand up guy.